Jakob Storp, Natalia Lopez-Edge and Nic Baruffol win the SYPT 2018 at the University of Basel. Johann Schwabe, Florian Wirth and Aladin Bouddat win the SYPT 2017 at the EPFL. Kathrin Laxhuber and Marc Bitterli (both form the MNG Rämibühl) win the SYPT 2016 at the ETH Zürich. The Swiss Young Physicists' Tournament (SYPT) is a Swiss competition, where physics enthusiasts from secondary schools from anywhere in Switzerland participate. In a preparatory phase they carry out a small research project, whose results are presented and defended at the actual tournament. The International Young Physicists' Tournament (IYPT) is the international counterpart of the national competition. Teams from all over the world compete against each other and a diverse social program promotes social contact of members from different teams. Pro IYPT-CH is the organization that organizes not only the national tournament SYPT but also the preparation for both the SYPT as well as the IYPT and the qualification for the Swiss team. The SYPT 2019 was held on the 23rd and 24th of March at the FHNW in Brugg-Windisch. Roughly 70 students presented their projects in front of a jury. After the three preliminary rounds the teams Black Physics, Team Räupli and The Excited Ground States qualified for the final. In a competitive final the team The Excited Ground States consisting of Nicola Widmer, Daniel Gotsmann and Daniel Swingler won the 12th Swiss Young Phyisicists' Tournament. Congratulations to the winners and all our participants for a great tournament! We would like to thank the FHNW as well as all helpers who made such a successful event possible. The SYPT 2019 will take place on the 23rd and 24th of March at the Fachhochschule Nordwestschweiz in Brugg Windisch. We are delighted to have found an attractive venue for the 2019 Swiss Young Physicists' Tournament. Over 70 students have registered for the 12th edition of the SYPT. In the months prior to the tournament they work on of 17 interesting physics problems. In preparation to the tournament students should discuss theoretical aspects and investigate the phenomenon experimentally. At the tournament students then present their findings in a physics fight (click here for more information on how the SYPT works). Students have the option to take part at the SYPT Physics Week where they will be coached on their respective problems. The Physics Week 2019 will be held from the 11th to the 15th of February at the MNG Rämibühl in Zürich. Please note that due to organizational reasons only the problems 3, 4, 5, 6, 8. 9, 11, 12, 13, 14, 15 and 17 are offered at the Physics Week. Places at the SYPT Physics Week are limited. The individual ranking can be found here. The SYPT 2018 will be held on the 17th and 18th of March at the University of Basel. We are delighted to have found such an attractive venue for our participants. The majority of the tournament will take place in the Kollegienhaus of the University of Basel. Participants not living in Basel will be accomodated in the youth hostel St. Alban. Non-local jury members will stay in the Hotel Novotel Basel City. In preparation for the tournament we will again organize a one week preparation course, the SYPT Physics Week. During this week students work on their chosen problem while being supervised by SYPT-experienced coaches. High quality experimental equipment will be provided. The SYPT Physics Week is scheduled for 12th to 16th of February at the MNG Rämibühl in Zurich. In Singapore, the young physicists secured Switzerland a bronze medal. This marks the sixth time in a row that a Swiss team returns home with a medal, it is evident that the longtime engagement continues to pay off. 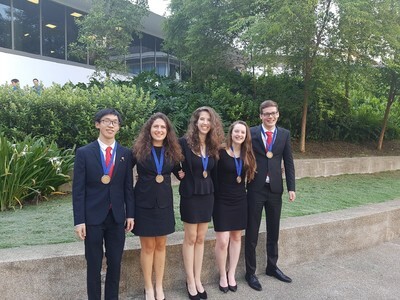 Once again, this year, 5 students had the privilege of representing Switzerland in the International Young Physicist's Tournament, which took place in Singapore: Zara Vance, Tehya Birch, Ivana Klasovita (all attending MNG, Rämibühl), Florian Würth (KZO) and Xiao Yu (Lyceum Alpinum Zuoz). Due to our success at the Swiss Young Physicist's Tournament in Lausanne and the following team qualification round in Zürich, we were chosen to travel to Singapore along with Eric Scherternleib (Team Leader) and Daniel Keller to go up against the 30 other participating countries. We were also accompanied by Samuel Byland (Juror) and Émilie Hertig (member of Team Switzerland 2016, Russia) and they played their part in helping us along during our adventure. The SYPT 2019 will take place on the 23rd and 24th of March at the Fachhochschule Nordwestschweiz in Brugg Windisch.